I have heard a lot of stories about tomato saying that it is a powerful folk medicine. My grandfather, grandmother, and uncle had an acre of farmland planted with tomatoes and other crops. When food shortages occurred during WWII, our daily foods were comprised of only potatoes and tomatoes. They told me that tomato could heal all our sufferings and maladies. Today, we realize that tomato is one of the most recommended and nutritious vegetables in your backyard garden. One medium-sized tomato, about 150 grams in weight has about 35 calories, 0.5 grams of fat, 5 mg of sodium, 7 grams of carbohydrate, 1 gram of dietary fiber, 6 grams of sugar, 1 gram of protein, 20% vitamin A, 40% vitamin C, 2% Calcium, 2% Iron. That's a great vegetable or you call it fruit. Recently, we read from medical journals that tomatoes are good for cancer prevention. Wow, it's really great. What our ancestors narrated to their children was true. People who ate tomatoes regularly have a reduced risk of contracting cancer diseases such as lung, prostate, stomach, cervical, breast, oral, colorectal, esophageal, pancreatic, and many other types of cancer. Some studies show that tomatoes and garlic should be taken together at the same time to have its cancer preventive effects. Whatever it is, we really do not know how or why tomatoes work against cancers. We believe that lycopene and the newly discovered bioflavonoids in tomatoes are responsible as cancer fighting agents. Not only raw tomatoes but also cooked or processed tomato products such as ketchup, sauce, and paste, are counted as good sources of cancer prevention. Tomato is also good for liver health. 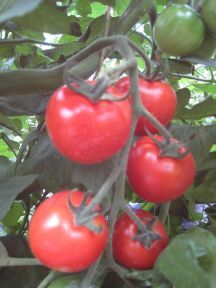 Tomato has detoxification effect in the body. Probably it is due to the presence of chlorine and sulfur in tomatoes. According to some studies, 51 mg of chlorine and 11 mg of sulfur in 100 grams size of tomato have a vital role in detoxification process. We know that natural chlorine works in stimulating the liver and its function for filtering and detoxifying body wastes. 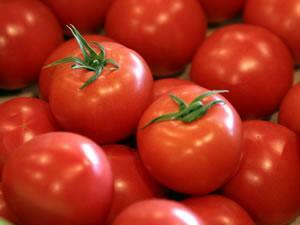 Sulfur in tomatoes protects the liver from cirrhosis, too. Tomato juice is known as good energy drink and for rejuvenating the health of patients on dialysis. Herbalists knew that taking tomatoes and tomato products could reduce the risk of cardiovascular diseases because of lycopene in it. What is your worry when you take too much food that contains animal fat? Butter, cheese, pork, egg, beef, and other fried foods. Take tomato, it will prevent hardening of the arteries. Therefore, tomato can reduce high blood pressure, too. Red ripened tomato is a powerful antioxidant. Vitamin E and lycopene in tomato prevents LDL oxidation effectively. Bean sprouts, cabbage or barley malt contain vitamin E. Tomato is an excellent fruit or vegetable for rapid skin cell replacement. Tomato juice can be used for healing sunburn because of its unique vitamin C. You can also name tomato juice as a good sports drink to restore yourself from fatigue and sleepiness. Let's plant marvelous tomato in a container garden if you don't have a backyard garden. Note: There are people who claim that tomatoes can cause kidney stones. Where did they get such false information? From commercial ads by soft drinks companies to contradict tomato juice manufacturers? How about Italians who eat a lot of tomato ketchup, paste, and juice? Do they suffer from kidney stones? Do not believe it unless it is proven!